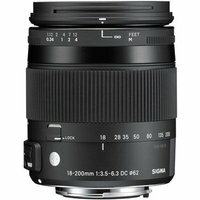 The Sigma 18-200mm f3.5-6.3 DC Macro OS HSM Lens Sigma Fit is a standard zoom lens with macro capabilities covering a wide-angle of 18mm to a telephoto zoom of 200mm. Despite its versatile reach, the Sigma 18-200mm f3.5-6.3 DC Macro OS HSM lens remains extremely portable, compact and lightweight. This high performance lens is designed for APS-C/DX format sensors and delivers a minimum focusing distance of 39cm and a maximum magnification ratio of 1:3. What's more, the built-in Optical Stabilisation (OS) and Hyper Sonic Motor (HSM) enhances the lens' usability making it convenient for handheld photography and night time shooting. This lens is perfect for travelling and covers a wide variety of photography applications, such as landscapes, portrait, macro and general purpose shooting. Furthermore, the lens firmware and adjustment parameters such as focus can be updated with the use of the Sigma USB Dock (not included, available separately).